Two Fingers is a four piece band from Dimapur formed on May 26 2018 with the motto “Spread peace”. Living up to their motto, the band focuses on taking action and developing compassion to create inner peace within ourselves and with family and friends through music. The five-month old band was one of the finalists at the Kohima based NSACS 2018 competition. The band also participated in the first mini hornbill in Wokha & won 1st runners up and the bassist & drummer won the ‘best bassist’ & ‘best drummer’. 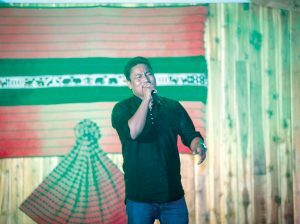 They recently performed at the Amur Falcon festival at Doyang and the vocalist Saronthung Kikon got an opportunity to perform a solo piece called “Amur falcon” an original which is yet to be released. EASTERN MIRROR: For the record, could you guys introduce Two Fingers and your role in the band? Two Fingers: Two Fingers Band is a four piece band formed on the 26th of May 2018. The band consists of Saronthung Kikon on Vocals, Chumdemo Yanthan on Guitars, Imjungtoshi Longkumer on Bass and Mhabemo Ngullie on Percussions. We are currently looking for a keys player to incorporate into the band. EASTERN MIRROR: How did Two Fingers come into reality? Talk us through your journey and the reason behind your band’s name. Two Fingers: Initially it all started when Saron and Chumde met over dinner after having heard of each other. 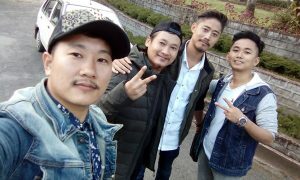 Saron was a vocal teacher at Musician Studio, Kohima and Chumdemo was a guitar player involved in the Faith Shapers Worship Ministry, Thahekhu Village Baptist Church. They jokingly contemplated performing on World Music Day 2018 and that is when they decided to look for more numbers to complete the band. Saron called up Mhabemo who was an old friend and he readily accepted the call. The search for a bassist took longer but with the help of Bendang, the drummer of the band Yellow Beacon, they met Imjungtoshi who was also involved in worship ministry. With that the band came together as a four piece group on the 26th of May 2018. The idea of the name of the band came from the collective philosophies of the boys who believe in promoting peace and compassion through their music. Two fingers universally, as a sign represents peace. And that is where the name of the band came about “Two Fingers”. EASTERN MIRROR: How would you describe your music? Two Fingers: Honestly, we are still lost in that aspect. We are experimenting together and open to different genres. Our music is open for your own interpretations and at the end of day the collective goal of the group remains to leave an impact on everyone who comes to the shows or listen to the music. EASTERN MIRROR: Do you write your own songs? What are the main themes or topics that you cover? Two Fingers: As of now we have a friend Abdon Mech who is also a singer/songwriter currently based at Thahekhu Village. He helps us write our material and brings into life the thoughts that we carry. As of now we have two originals and the idea behind them is to share of grace and positivity, of peace in the midst of storms and hope in the midst of loss. We will be recording them soon and hopefully our visions of the songs transcended to those that listen to them. EASTERN MIRROR: Apart from the music that you guys are involved in, do you have other jobs? If so, how do you balance music with other obligations? Two Fingers: Yes we are all music teachers who are also learning at the same time at Livingstone Foundation Higher Secondary School, Dimapur. Apart from that, we are all involved in different worship ministries in our respective churches. It’s not very challenging for us to balance music and work as we are all working at the same place so it becomes easy for us to share ideas and work together all the time. EASTERN MIRROR: Working as a group is not easy especially when each individual has different ideas and tastes. How do you work it out? Any issues you have faced initially? Two Fingers: It’s always inevitable that differences in opinions will come into play in a group and the same happens to us too. Given that we have different backgrounds in music genres, sometimes it becomes as an issue but we have always worked it out. We are all still learning about each other and about music together. It’s a collective process always and at the end of the day we all rest on that very fact. EASTERN MIRROR: What are the issues that your band strongly feels about in relation to the music scenario of the state? Two Fingers: I think we all know the issue that lies in the music scenario in our state. It has been addressed over and over again. Infrastructure and support has always been very poor and honestly, musicians are under paid in our state. People still expect free shows and disregard the profession of music. We are as much a working force as a government job holder or an everyday profession that is paid for their services. The hardwork that we put in day in and day out is overlooked. Infrastructure and platforms are improving gradually and more festivals and events are coming up but the support or appreciation and respect towards a musician is still lacking among the public. Nevertheless it’s still a process and we are still growing together and things will surely get better. EASTERN MIRROR: What’s the band’s goal at the end of the day? ‘Any plans on a professional front? Two Fingers: The ultimate goal of all of us is to make a living out of doing what we love to do most, i.e. to make music. It has always seemed like a farfetched dream for Naga musicians to achieve that feat but it has been achieved already. The likes of Alobo Naga Sir and Nise Meruno Sir and so many others are testament to the fact that you can really make a living out of music through perseverance even in Nagaland. We hope this band achieves the same and remains intact for a long time and make good music. For now we are looking forward to recording our music and we hope to finish a few projects before the end of the year. On a closing note, we wish to thank our friends, families and well wishers for always being supportive and making this band come to life. We would also like to thank a few special people who have been praying earnestly for us behind closed doors. On a special note, we would like to extend our heartfelt gratitude to our friends from the band Search and Found (SNF) for being our anchors and support system all the way. Last but not the least, thank you Eastern Mirror for taking a chance with a band that is still unheard and for giving us such a big platform. We are very grateful to your generous and supportive gesture.